Route: Leh, Nubra Valley, Pangong Lake are the highlights in the tour. Airport pickup and transfer to hotel. Full day rest, lunch at your hotel. After an early breakfast drive to NUBRA VALLEY leads through KHARDUNG-LA-PASS (the highest motorable road in the world) at 18,390 ft, around 39kms from Leh. Overnight at the camp at Hunder. 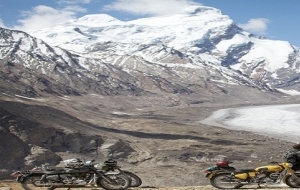 Full day excursion to Panamik, Kyagar, Sumur, Samesthaling gompa later on visit the SAND DUNES to enjoy a camel safari. After your breakfast at the camp, It’s a day to ride up to the another Pass (warila pass) at 17,500 ft, and road takes you through side of side of Shakyok river till Agyam village and then drive towards warila pass and roll down to Sakti village. Overnight in Guest house at Sakhi. Enjoy the landscape in the back drop of the Lake. One rarely feels so close to nature and environment and the scenery is unforgettable. Evening at leisure and overnight stay at the camp near lake. Early morning transfer to Leh airport for return journey. Bike mechanic and other goods carrier car are on supplement basis.